Rev-A-Shelf's chrome pull-down shelving system can lower those top shelf items down to your fingertips. 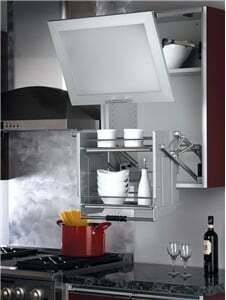 Are you a looking for a way to reach those top shelves in your kitchen without having to search for a stool? We have the answer! The Rev-A-Shelf's chrome pull-down shelving system can lower those top shelf items down to your fingertips. 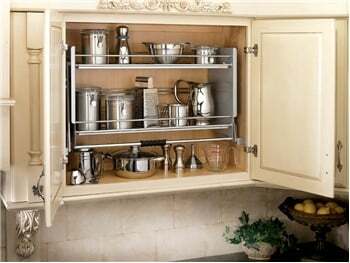 This shelf unit allows you to lower those hard to reach items 10" while extending out 14-3/4" from the cabinet. The unique gas assisted lifting and lowering mechanism provides unparalleled stability through the entire range of motion.